Founded in 44 A.S. under the name Valhalla Research the company received major backing from interests in the government and military by unveiling a breakthrough in materials research. By studying the great sleeper ships used in travel to Sirius Valhalla Research managed to discover a way to miniaturize the same drive technology that was used in the ship, on top of that they also improved on the design by increasing the power and efficiency of the drive. This new "Liberty Engine" allowed the travel between neighboring star systems could be accomplished in a matter of months rather then years. In 96 A.S. with the arrival of the LCC Einstein in Rheinland the first real-time communication is made in that communication business is conducted and a technology swap is made: Valhalla's new "Valhalla drive technology," is exchanged for Rheinland's advanced information on construction technology. The technology would be studied but nothing interesting would come of it until the arrival of the LCC Edison in Bretonia in 106 A.S. A deal is made with the government and Bretonia exchanges it's advances in materials technology for the new engine designs. In 120 A.S. Valhalla Research revealed their latest technological wonder in 120 A.S. Using the advanced construction and advanced materials technology gained through trading of the "Valhalla drive technology" a "Elevator" is developed, using superstrong crystalline polymers and frictionless bearings; when connected to orbital docking rings would completely negate the high costs of boosting men and materials into space, this technology revolutionizes exploration and industry almost overnight, opening up the entire New York system for commercial exploitation. Valhalla licenses the technology to the other houses, reaping huge returns in the process. With the success of the last Valhalla project they started planning for their next great project and at a secret meeting with the Order of Cincinnatus and the highest ranking board members of Valhalla Research, they reveal their ambitious plans for "Project Jump Gate" that would be completed in fifty years. Using the research that was made on Valhalla 1, the gate idea was created. These gates would allow travel between two distinct points in space, making it possible to travel between systems instantly instead of the many months ending the tyranny of distance which had ruled over humanity for so long. To start this project Valhalla Research announces that they will build a major research facility in Texas. The base would be used in the research of "Project Jump Gate" and Valhalla Research would be working with the Liberty Military on a number of secret projects. With the construction of the Research Station in 128 named Dallas, Valhalla Research began to expand their operations in the system and with the military declaring a large portion of space surrounding the Dallas off-limits many rumors abound as to what kind of research was being conducted around the Dallas. In 130 A.S. one of the most historic events in all of human history was made as the Valhalla Prototype Jump Gate was tested, Houston residents in the northern hemisphere would have seen a bright flash, like a meteor streaking across the sky at exactly 15:34 HST ...and then nothing. The flash was a small drone leaping across the light years in the blink of an eye. It was the first successful test and the dawning of a new age. In 155 A.S. Valhalla Research becomes Ageira Technologies. In 180 A.S. just over 50 years after the first test of the Jump Gate the first full-scale jump between Texas and Alaska would be conducted, and five years later in 185 a ceremony that is broadcast throughout the Sirius sector. The President of Liberty unveils the jump gate project to the public, and almost immediately the other houses of Sirius begin to conduct business deals with the Ageira to purchase the technology and a deal is signed with Sirius Shipping to transport the gate parts between the R&D labs of Ageira and construction projects being built by Deep Space Engineering. In 189 A.S. The first official jump gates are built between New York and Colorado, opening up the mineral riches of the Colorado systems to the rest of Liberty. In the following years construction would begin on more gates and in 207 the systems of New York and California would be connected, and with most of Liberty connected with Jump Gates Ageira began construction a Manufacturing Facility in Colorado. This facility would be crucial in the mass production of jump gate components to meet the high demand. The facility would be completed in 215 A.S and begin the exporting of parts to the other houses to connect systems of their own. As mass production of the gates moves into high gear, funding becomes an issue for many foreign corporations and governments who wish to build routes of their own, because of this Ageira Technologies and Deep Space Engineering capitalize a whole independent entity in 218 and Interspace Commerce is formed to offer loans and assist in the financing of jump gate construction. In 280 A.S. Ageira Technologies introduces their next advance in technology, the advance which was almost as miraculous as the jump gates revealed almost a century ago. The "Trade Lanes" using a variation of the jump gate architecture could be built along a arbitrary route through systems to accelerate ships to superluminal velocities. These trade lanes would assist in commercial trading within systems and used with the Jump gates a sector wide economy was created. Eventually the demand for Gate parts began to shrink and the demand for lane parts increased because of this in 420 A.S. the Ageira Technologies facility in Colorado downshifted its production of jump gate components and concentrated on producing trade lane components. In 500 A.S. the Ageira Technologies scientists aboard the Dallas began the second phase of testing a new, long-range jump gate that would have allowed travel beyond the Sirius Sector. Unfortunately, a concentration of dark matter along the jump route created a feedback wave that destroyed the Dallas and everyone aboard, and expelled huge masses of dark matter throughout the system. A quarantine was immediately erected across half the system. The prototype gate sank into a monstrous singularity that is still there today. With the Texas system scarred Ageira Technologies withdrew most of their operations from the system. After the Texas Incident, Ageira Technologies stayed quiet until the opening of the Detroit Munitions Depot in New York in 614. It specialized in the manufacture of small and medium arms supplying the Military, Police and independent buyers who became frequent customers. In 700 A.S, Ageira Technologies and Interspace Commerce became partners to develop the "RTS" or "Real Time Scanner" which would scan cargo passing through the jump gates and trade lanes; by attaching a Universal Ship Identification number to every vessel and piece of cargo, governments could automatically scan for contraband while Interspace Commerce could more accurately assess insurance fees. The new scanners begin production at the Ageira Technologies Facility in Colorado. Ageira Technologies continued to gain profit from Gate and Lane parts as well as it's other facilities in the ninth century, and to this day is the only supplier of the components with the exception of DSE. Ageira Innovations is a name coined for a new philosophy adopted by the Ageira Technologies after retirement of President Thaddeus Gideon. A new model with multiple competing and relatively independent divisions was introduced. Flat structure, project-oriented resource distribution and achievements-based funding allowed Ageira Technologies to better shape their efforts in maintaining the position of unquestionable leader in the field of technology advancement. Establishing the themselves as the pioneers of research and capitalizing on product perfection and innovative designs it was short time before Innovations started to expand the business beyond laboratories. Soon, transports started exporting top-of-the-line products while importing back rare materials and resources for factories and facilities. After the first contact with Bretonia, Ageira Innovations was given major Light Arms order. With the help of independent contractors that was paid substantial subsidy for their efforts and participation, Bretonia was supplied with at least 120.000 firearms so that their officers could defend themselves against any boarding party coming their way. Deep Space Engineering took interest in Innovations after the name reached the news. A contract to ship large number of Jump Gate Parts to Camrose Depot was signed and Ageira Innovations started one of the largest manufacturing quotas on Pueblo. Within 6 weeks it was completed with the help of independent contractors who were paid record-breaking subsidies. With the funds gathered from these contracts, Ageira Innovations set their horizon on establishing itself as corporation with the most advanced fleet of transports and the most efficient employees dedicated to provide Sirius with technologically superior products. Rumors say that current transport fleet is feared by the Lane Hackers themselves. Being founded on 821-03-16, the corporation started to gain recognition and by carefully waiting for a good moment it was finally ready to try and obtain the majority of Ageira Technologies stocks so that it could guide it to new heights. The road is still long but there are no easy things in life and this is nothing but a small obstacle that must be tackled. 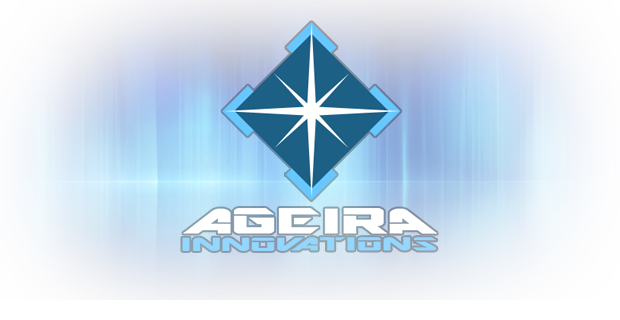 Succeeding by collecting majority of stocks in 822-01-16, Ageira Innovations started a new era of prosperity and market dominance that would put Ageira Technologies back on track with high-investment research in furthering technology beyond known limits to mankind. Ageira picked up unusual readings from Hudson system in 822-06-06 and sent a team to investigate. Three days later it was revealed that Rheinland's decision to shut down the Jump Gates on their own have invoked a state of semi-closed wormhole that accumulated of singularity in Hudson-Hamburg Jump Gates. Ageira instantly shifted all research teams to determine solution in order to avert disaster. In the mean time, Liberty and Rheinland came to a ceasefire to provide support in protecting Jump Gate repairs. Hudson-Hamburg Jump Gates were finally repaired at the end of 822 AS and the opened to public on 823 AS, marking a new chapter in Liberty-Rheinland conflict. After four long years, the border was finally reopened even though the embargo laws are still in effect for the time-being. Few months later, a diplomatic convoy for peace treaty signatories were organised and escorted to Rheinland where it was signed and finally ended the war opening free trade once again after long years. Continued negotiations with The Core has led to fruitful contract to build Docking Ring at Planet Nauru. Being so far out of regular Ageira routes, navigational charts were requested and dangerous routes have been drafted. Resistance and hostile elements were expected in Omicrons however none of know terrorist or pirate groups were encounter during shipping. Commodities were delivered in month and Deep Space Engineering has already assembled Docking Ring. Testing has been started to account for different gravitational forces in deep Omicrons to provide the most reliable elevator functions. Attack on Fulda Border Station by unknown forces disguising as Gas Miners Guild has left Jump Gate in ruins. Ageira has tried salvaging as much of their proprietary technology but vultures in form of Junker Congress or ALG and possibly many more has tried to get their hands on valuable remains. These disasters are bringing in huge profits for company however illegal salvagers is putting Ageira in tough position due to risks of reverse-engineer their technology. While negotiations on repairing Sigma Jump Gate was underway, a surprise attack was launched on Alberta Jump Gate during which Liberty forces repelled Battlegroup Harmony and Lane Hacker wing of fighters. During chaotic skirmish Battlegroup Harmony bombarded Jump Gate and left it in ruins. Since this is Liberty and direct access to secretive project in Alberta, repairing began instantly and was finished in few weeks. Later on, Battlegroup has attacked Leduc and while skirmish happening outside was repelled, terrorist have managed to board the station and steal encrypted yet still valuable data-drive. After that was sorted out, Ageira Innovations went back to issue with Sigma Jump Gate and finally made a deal with Rheinland. The negotiations took place in hopes that Rheinland would change their laws to reflect that only Big Three can transport Ageira White Boxes in their territory however unwilling to bend over, Rheinland has only approved these conditions for Ageira Technologies and Deep Space Engineering, leaving Universal Shipping without such permission for the time being. In preparation for constructing the second Supergate, Ageira have disassembled Hamilton Station in Ontario, in order to quickly assemble Plymouth Outpost in Poole where location on their next-generation Jump Gate will be erected. With Sprague lanes finally being constructed, Ageira could divert all attention to monumental task they set out to complete and attempt a direct connection between Alberta and Poole systems. Should this endeavor succeed, it could open direct combat support against Gallia and much faster and safer transportation of commodities. After months of progress, all four Sirius houses includes Ageira White Boxes as restricted cargo that is only to be shipped by Ageira, DSE and Universal. While negotiations with Rheinland is still underway to finally include Universal Shipping, Bretonia and Kusari has made law revisions without discussion. In light of this, Ageira Innovations has expanded its protocol and will be confiscating proprietary Ageira White Boxes anywhere in Sirius. During all this legislation, Nauru's Docking Ring was finally activated and is now fully operational. Years have gone since initiating Cold Lake Project that now has finally been completed by constructing Alberta and Poole Supergates. These massive projects required billions of investment and thousands of tests to finally be deemed fit for operation. Liberty sent a number of battlegroups through it towards Bretonia in order to repel siege of New London by Gallia. Most battlegroups made it through safely, however two of those are missing. This was known risk of using such long range FTL connection but deemed acceptable while facing total obliteration of Bretonia without any reinforcements. With Kusari-Rheinland war waging and EFL being contracted by Rheinland to start expanding into Sigma-15 system, Ageira Innovations has offered their services to Kusari in order to construct Jump Gate connection straight into Sigma-21. With construction sites deployed on both sides and chassis for Jump Gates completed, Kusari has failed to protect their investment in Sigma-21 system and Rheinland forces laid siege after allowing civilians to evacuate. Monument of Kusari's failure now floats in a form of station wreck with destroyed Jump Gate chassis nearby. Ageira Innovations is never taking a break from innovating and finally was able to use technological advances to enhance and upgrade Bison with thinner yet relatively stronger alloy for its hull thus increasing maximum payload. Of course, adding some flavor to the outside of the ship to signify advanced technologies and screaming superiority was achieved by installing few additional lights and beautiful logo of Ageira Technologies on both sides. Stegodon is the name of this unique and marvelous transport. • Expanding Jump Gate and Trade Lane network. • Buying out Fort Severn and have Big Three produce Military Vehicles. • Investigating Artificial Intelligence and reinforcing security against breaches. • Exterminating Nomads and other aliens to salvage and adapt their technology. Ageira Innovations decided to use Libertonian ships and equipment to reduce manufacturing and maintenance costs. Mammoth is a smaller and more agile option for local Light Arms distribution within Liberty systems. It is better suited for maneuvering tight corners and evading greedy eyes of criminals. In the meantime, Ageira's Stegodon is the only proper choice of every captain who cares for their safety and the security of their cargo. These heavy transports are modified versions of Bison with enhanced armor plating that is thinner but still as strong thus providing additional cargo space for commodities to be transported. Ageira Innovations decided to use flat structure to allow better and easier organisation, where all employees report back to President. Such structure cuts down on intermediates and unnecessary paperwork and allows more fluid organisation of work assignments. Each and every employees is free to choose his preferred field of interest and concentrate on what he can do best to increase the efficiency and quality for the benefit of whole corporation. • Secure Channel - United Engineering, Ltd.